58-year-old Patricia Wilson held a green card for nearly four decades. She poses here after completing nearly four hours of paperwork necessary to become a U.S. Citizen. More than 50,000 immigrants in Hawaiʻi are eligible to become American citizens but have not yet applied. That’s according to the U.S. Citizenship and Immigration Services Agency. But the current political climate may be compelling more of them to take on the costly and lengthy task of becoming a citizen. 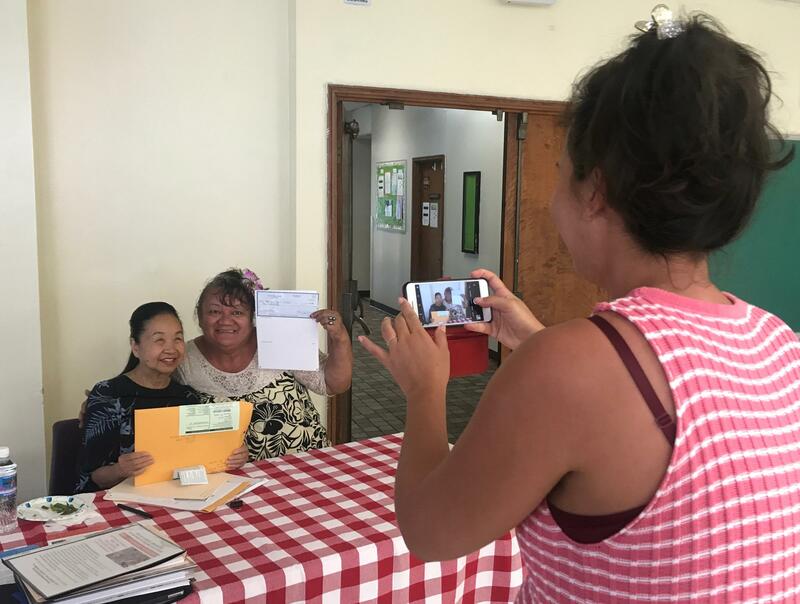 And now, HPR’s Kuʻuwehi Hiraishi reports, they’ve got a little help. For nearly four decades, Patricia Wilson was perfectly content carrying a green card that allowed her to live and work legally in Hawaiʻi. The 58-year-old immigrated from Tahiti in the early 1980s. But this past Saturday she took her next step toward U.S. Citizenship. 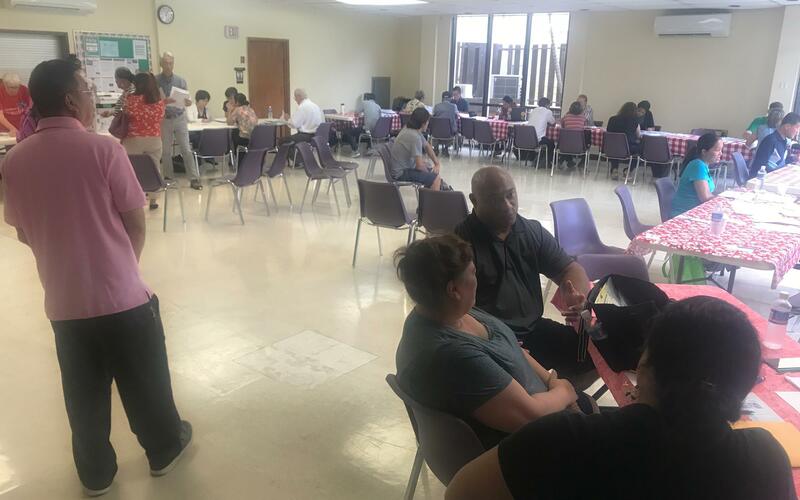 Volunteers from the William S. Richardson School of Law (right) help Hawai'i immigrants navigate the lengthy yet meticulous process of naturalization to become a U.S. Citizen. “Because I’ve been living here long enough to realize that weʻre lucky to enjoy the freedom that we have here,” says Wilson. Freedom that she wants to secure by becoming a citizen. Wilson was one of 20 Hawaiʻi immigrants who applied to become U.S. Citizens at a legal clinic held at the First United Methodist Church in Honolulu. 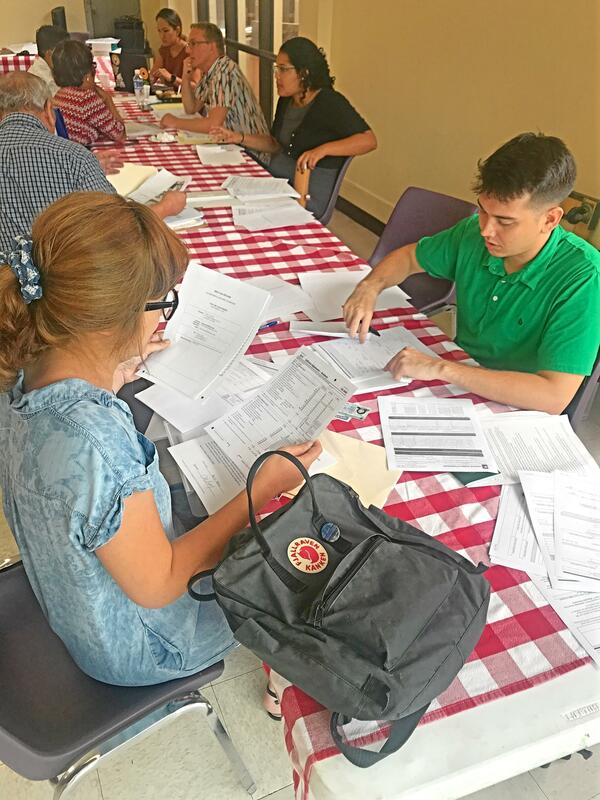 Volunteers reviewed piles of documents and completed copious amounts of paperwork. Immigration lawyer John Egan spent his morning there. He oversees the Refugee and Immigration Law Clinic at the William S. Richardson School of Law. Immigration lawyer John Egan (top left) rummages through paperwork to ensure the correct amount of photo copies are made for all necessary documents. More than 50,000 permanent Hawai'i residents are eligible to become American citizens but have not yet applied. 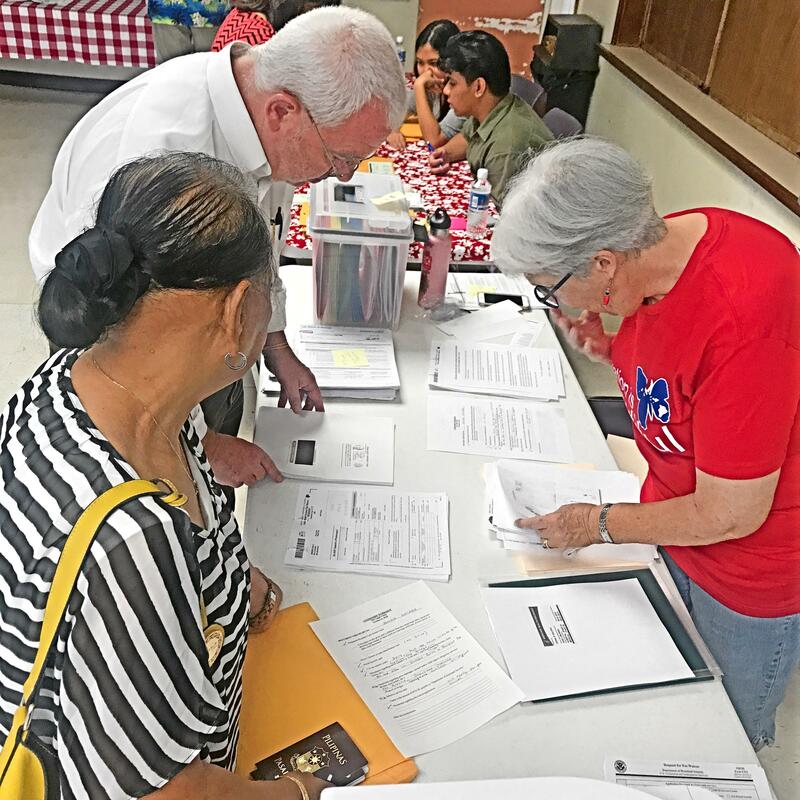 The Citizenship Workshop held last Saturday at the First United Methodist Church in Honolulu helped at least 20 of them take that first step. And thatʻs a big deal. Egan says the national rhetoric surrounding immigration as well as the Trump Administration’s unpredictability have immigrants on edge. 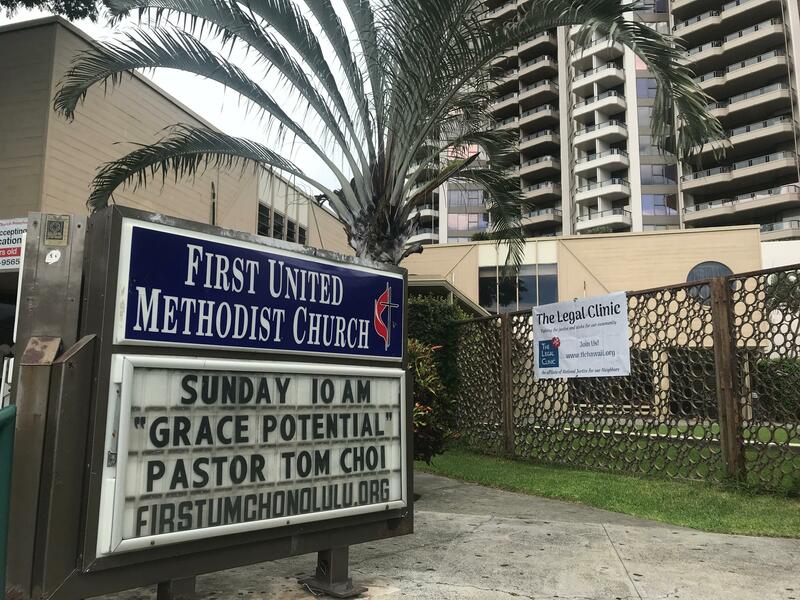 A citizenship workshop was held at the First United Methodist Church in Honolulu. Amy Agbayani helped organize the event. She’s with The Legal Clinic, a new non-profit that provides free or low-cost legal services to immigrants. The clinic is one of 17 across the nation supported by the Methodist Church, whose local membership is made up largely of immigrants. 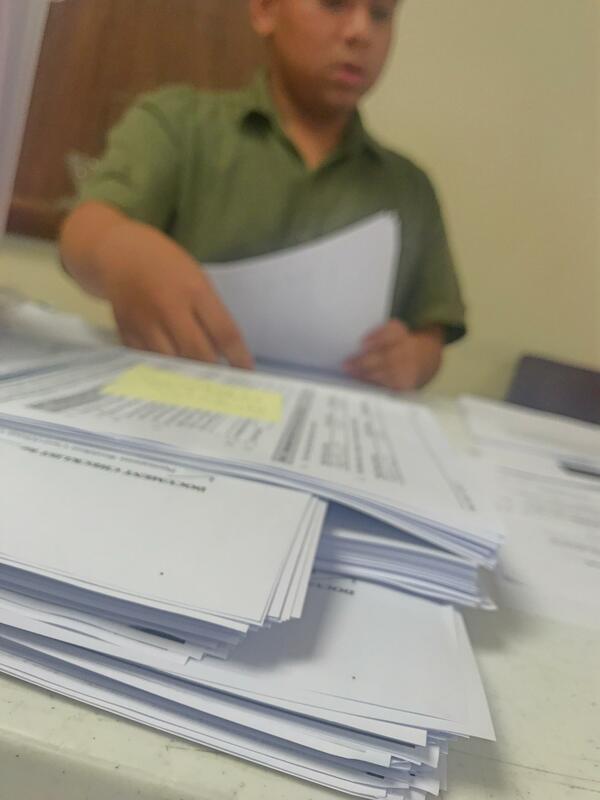 A volunteer at The Legal Clinic's first Citizenship Workshop sifts through piles of immigration paperwork. She says the clinic is specifically looking to fill a void in legal assistance for the estimated 45,000 undocumented immmigrants in Hawaiʻi.